By ensuring that everything you do is in line with your strategic priorities you significantly increase your chances of focusing on the most promising opportunities and reduce the risk of wasting resources on unproductive activities. We have developed a workshop-based approach to prioritisation which looks at your business as a whole within the context of the constraints you face. The management team emerges from this fast and effective process with a clear, shared understanding of how to improve the company's ability to win orders, its business priorities and its strengths and weaknesses. We do this by analysing priorities and performance across the business during a day of interviews with senior managers and functional leaders. We present the findings at a workshop and review them in detail with the management team. These results are graphically represented and easy to understand, providing a powerful communication tool which helps to build rapport across the business and enables managers to compare their priorities with their colleagues. The data generated also provides a useful performance reference point for the business which can then be revisited to assess the impact of improvement activities. The process may also indicate that you need to reassess which markets and product groups you should focus on, and on what basis you should be competing. If this is the case, our other approaches to strategy and capability development may be useful. We have used our ‘prioritisation’ tool with more than 750 companies to date. It also provides the basis for the Institution of Mechanical Engineers’ National and Regional Manufacturer of the Year Awards scheme. IfM is one of the partners delivering a government-funded programme - Sharing in Growth - aimed at developing the capabilities of small and medium-sized suppliers to the UK aerospace and civil nuclear sectors. 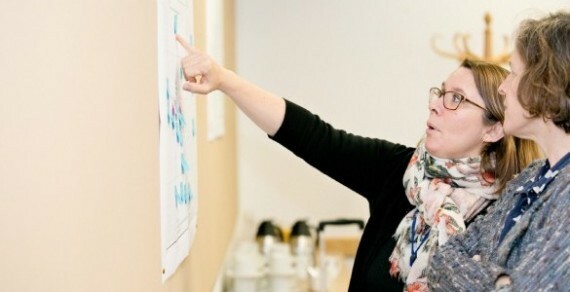 The programme provides training and development to help firms in the supply chain overcome barriers to growth and increase the number of high value jobs in the UK's aerospace and associated high value manufacturing sectors. 1. 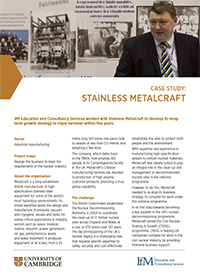 Read how our 'prioritisation' process helped to unlock huge opportunities for specialist metals fabricator, Stainless Metalcraft.